All of the Worlds major tech companies are slugging it out at IFA Berlin 2013 at the moment. Mobile technology and 4K are two prominent themes, making this Panasonic offering really standout. Panasonic, as you’d expect, always put on a big show at trade show events like the Consumer Electronics Show in Las Vegas and the IFA event in Germany, and this year is no exception. Their booth is full of exciting new products, but the Worlds first 4K tablet really does take the biscuit. This particular model has been designed with businesses in mind however. Whilst there’s no conceivable reason why you couldn’t use it in front of your TV in the evening – as most people seem to use their tablets at the moment – this one is intended for showcasing information and videos in environments like Zoos and museums. Its £4,500 price tag shows that its aiming at markets above and beyond the home, as well as the sheer horsepower that panasonic have bundled into it. You’re looking at 8GB of memory as standard, as well as an Intel Core i5 vPro processor and Nvidia GeForce graphics. If these stats down mea much to you, you’re basically looking at notebook specs within a Windows 8.1 powered tablet. Needless to say, this is a little more powerful then you need for web browsing and pinging off a couple of emails. Therefore, it is clearly designed with commercial use in mind. Its case is made out of carbon fibre, making it large and very rugged. It has clearly been developed to withstand a lot of hard, daily abuse. Within this case sits a stunning 3,840 x 2,560 pixel resolution display unit, which delivers a picture quality that is truly spellbinding on a tablet. We have been in awe of the super-resolution TV sets ever since seeing the Sharp 8k TV set at CES 2012, but the introduction of 4K into a device that by its very nature you touch and feel, adds a whole new dimension to the awe-sinspiring experience. Panasonic have clearly set out to wow museums in particular with this device. 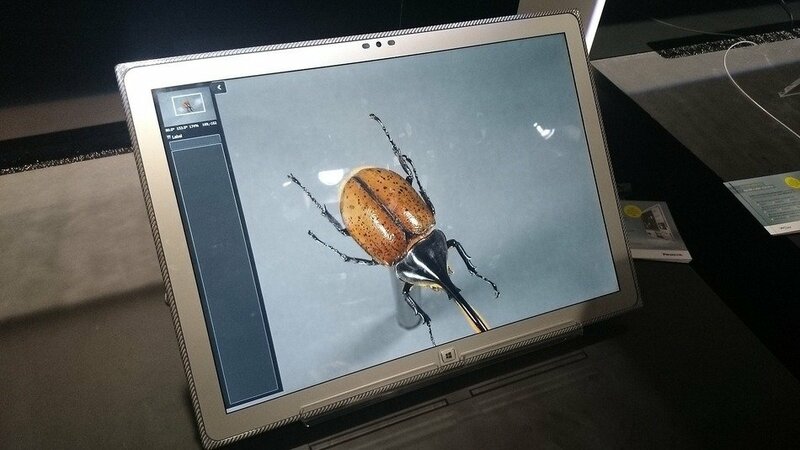 At IFA, they are currently running a pre-made museum setup complete with this 20 inch 4K tablet, with the tablet brining the exhibition to life. You can ‘touch and feel’ the exhibition, zooming in on particular aspects and then easily rotating the exhibits to view from all angles. Museums are increasingly adopting tablets, but the introduction of the much larger and much clearer Pansonic would definitely take this up a notch of two. The Panasonic Toughpad 4K will make its bow in Europe this November.